This lesson plan is a great way of integrating already known body parts vocabulary together with verbs describing movement. Students are going to watch a workout video and later prepare and present their own workout while the rest follow their instructions. As fitness and healthy eating are more and more popular and we’re bombarded with all the fitness plans, here’s one your learners will dive into. By the end of the lesson students will be able to understand and give instructions regarding body parts’ movement. Moreover they’ll gain confidence when writing and speaking, as the commands are not so lengthy. 1.Show a photo, ideally of a celebrity, who’s particularly fit (e.g. Arnold Schwarzenegger or Jason Statham) that your students might admire or simply use this photo, and ask your students how would they describe these people. Possible answers: well-built, muscular, fit, slim. 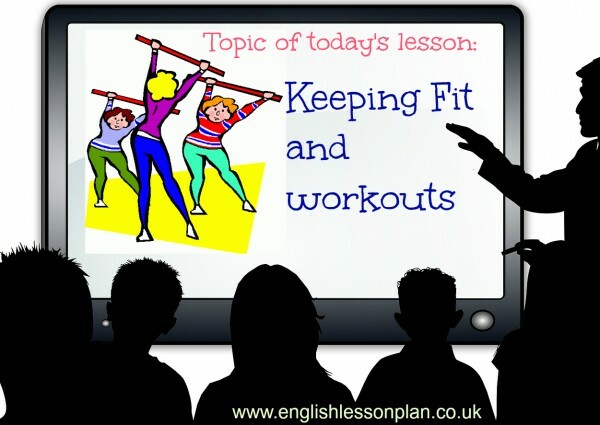 Ask learners what sort activities you have to if you want to keep fit? Possible answers: go running, walking, cycling, doing push-ups. Later ask students what type of exercises they do or did in each stage of the workout. Ask them to explain the activity. By recalling these exercises you’ll be able to elicit some key phrases. Depending on the level here are some phrases you should elicit: lift arm/leg, bend shoulder, hip circles, knee circles, crunches, squats, stretch. Which of the words are used in the video? tummy raise belly lift toned chill out tight arms legs thighs knee bend excuses drop elbow (words that are crossed out weren’t used in the video). Make sure you go through all the words to check if learners understand the meanings. b. How many parts of workout are included in the programme, what are the names? Answer: cardio, arms, legs and core,cool down,chill out stretch. d. What is the third exercise shown on the video? 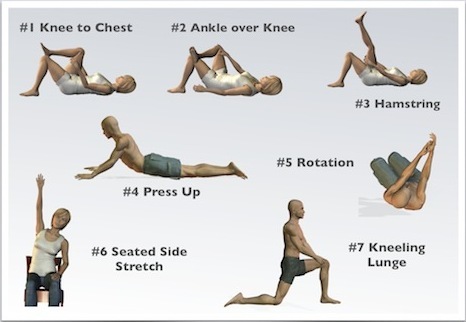 Do you think you can do 10 repetitions of this activity? Answer: the activity is called ‘squads’. The answer to the other question depends on students physical condition. Students should write a step-by-step procedure how to do a particular activity. The choice of the exercises is up to students, they should remember that the activities can’t be too difficult. You should monitor and correct the students’ work during the writing process. Allow 15-20 mins for writing and later have fun doing the workout 🙂 . One student from a group should read the instructions while the other members demonstrate exercises to the rest of the class. Other learners join the workout. Hope your students enjoy this lesson.